ANTI-FOAM AGENT 4oz Just like milk blended into a cappuccino, Real Milk Paint® will sometimes develop a foamy head when strongly agitated. 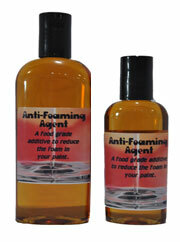 Anti – Foam will reduce or eliminate foaming and bubbling in our non-toxic paint, enabling easier mixing and application. Anti-Foam will help the powder pigments disperse more easily into the water; some of the pigment powder colors such as “Salmon” and “Bright Red” tend to float on the water, making mixing and homogeneity difficult. Anti-Foam will break surface tension to allow faster mixing and the proper texture of paint for application. As a side benefit it will also make the paint smoother. Our Anti-Foam is a food-grade additive used to reduce the foam and improve the smoothness of your paint. It can be used when necessary to control the foamy head on Real Milk Paint®. Directions: First, mix Real Milk Paint® pigment powder into water, following written instruction. Mildly agitate mechanically or with a stir stick. After slightly mixing, add 2-4 drops of Anti-Foam per pint of paint. Stir into solution and watch the bubbles dissipate. When used in recommended amounts, Anti-Foam will not negatively affect adhesion of paint to surfaces.